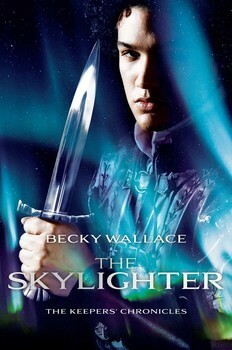 Welcome to our stop on Skylighter tour for Becky Wallace. 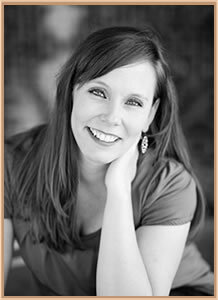 This tour is hosted by Rockstar Book Tours. What did you enjoy most about writing The Skylighter? How is the cover of The Skylighter a good fit for the book? There are a few really cool elements of the cover that are hard to understand until you read the book! The colors are taken from what the Keepers see when they look at the magical wall that protects Santarem. The leather armor that the model is wearing is exactly what I pinned when I was looking for inspiration. My editor, Annie Nybo, actually laced the bracers herself! Were any characters in the book inspired by people in your life? Sort of? I stole bits and pieces of real life people and intermingled them. Take Dom for instance. I can say that I dated a darkly handsome, charming, witty, player in college. I’d love to say that particular college boyfriend was deeply caring and a little self-conscious underneath, but no. Dom—thank heavens—is more three dimensional than that real-life person! What is your favorite scene in The Skylighter? I have a few. The easy answer is The Inn Scene (Chapters 4 and 5) because it involves kissing. BUT there are two other scenes that I’m super proud of! One I call The Heartbreaker (Chapter 46. You’ll get the title when you read it!) and the other is The Interrogation Scene (Chapter 62). Those two scenes made me feel sick for my characters. And I think when you feel empathy for a fictional person, then that character has become real! Do you incorporate yourself into your characters? If so, which character are you most like? Johanna has some of my better characteristics and maybe one of my worst ones. She’s intensely devoted to her family, and will do anything to protect them. But she also really hates to lose an argument. I mean...sometimes I’m just right, you know? I never struggle with beginnings or endings, but middles kill me. I want to quit middles, usually because I have SO many things going on and I need to make sure that all the threads are coming together at the right points with the right impact. Middles are jerks. What is an unknown fact about The Skylighter? It was the longest first draft I’ve ever written, and I’m a notoriously short drafter! The version of THE STORYSPINNER I submitted to my editor was a very tight 72,000 and it went to print at…98,000? THE SKYLIGHTER’s first draft was 111,000 and we cut it down to 98,000. Cutting was a lot more painful than adding. I’ve woken up with my laptop still on and a kink in my neck. 60,000 plus words, and I can’t make myself finish them. I can’t turn my inner editor off long enough to ignore the mistakes in the early parts of the books and just write the darn endings. It’s ridiculous. I know. Making time to write. I have four children age ten and younger. Actively writing means that I’m ignoring things that need to get done. Like laundry. I’m sitting next to a pile of unfolded kids clothes right now as I type this (it smells great, btw). Unless you are independently wealthy and have no commitments, you have to give up something—exercise, television, friends, sleep, fresh food—if you really want to pursue your dreams. When people say, “I’d really like to write a book someday, but I just don’t have time,” I have to bite my tongue. A snippy, sassy part of me wants to wave to my car full of cleats, dance shoes, sports equipment, and three car seats, and then point to the iPad wedged between me and the steering wheel. I don’t have time to write either. I make it. I cannot wait to start reading this book! This is just the type of fantasy that I like to read. I am adding this one to my TBR list! The cover is beautiful and powerful! I love race against time stories with so much at stake--can't stop reading! Looks like a fabulous series! Thanks for the giveaway! Great interview, I love this series and would love to win a signed set!!! Becky's writing is amazing!!! The book covers are great! I want to read these! I really like the interview! Thanks for sharing, Becky!